Innovation and rapid adjustments to changing customers and markets lies at the heart of today’s competitive world. All companies are being pulled toward the center of a “Digital Vortex,” which is characterized by exponential change and the blurring of industry lines. Companies must adapt, or their odds of being displaced—or even put out of business altogether—markedly increase. Carrying out rapid digital transformation lies at the heart of the corporate adjustment process. A recent study by the Global Center for Digital Business Transformation, an IMD and Cisco initiative, predicts that four out of 10 leaders in each industry will be displaced by digital disruption within the next five years. Yet what if concerns about cybersecurity actually slow innovation or impede innovation? More than just an “insurance policy” against hackers, malware or other threats, agile, proactive, cybersecurity capabilities can actually help drive growth and innovation. Indeed, successful digital transformation, requires a strong cybersecurity foundation. With this foundation, companies will have the confidence to implement digital processes and technologies that fuel innovation and growth. Without it, companies may hesitate to start digital projects—stifling their innovation potential and opening the door to digital disruptors. 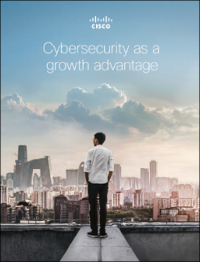 Oxford Economics worked with Cisco to develop the hypothesis and compose a report on the impact of cybersecurity in the era of digital disruption.